By separating the console wide, as you can not imagine the front seats to ensure the space, allowing for individual passenger seat and driver's seat, from the form, such as the coupe, rear seat full of space. In order to enjoy a comfortable long drive, we are thoroughly pursue quietness. ※ having both passion and the difference between the black tone of the material results in a gorgeous impression, is the active presence of mind and the combination seat. Before boarding and drive until the end. Centered on the fingertip, Pursued the operability flowing. About get accustomed to using, it is interior to charm and smart driver. ※As long as you carry a key, Unlocking just to grasp the door handle. 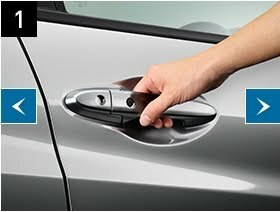 ※ Honda smart key system, which transmits radio waves, such as when the locking and unlocking. At that time, there is a possibility that affect medical electrical equipment of implantable cardiac pacemakers.